When I was 23 yrs old, I left my first job fresh out of college, most of my friends I made in college, and moved from Washington, DC to Italy. I knew no one, didn’t speak the language, and had one of the most incredible years of my life. It was such a bold period that I often look back on it and wonder where I got the courage to just up and go live in another country like that. Some things you really are brave enough to do only in your twenties! So when Elizabeth Gilbert’s book, Eat, Pray, Love came out, everyone encouraged me to read it, promising me that this woman would be one I would instantly connect with not only because of her passion for Italian language and culture, but for her love of travel. I could not get past the India portion of the book. Despite its massive popularity, I thought it was a cheesy self-help novel come to life. 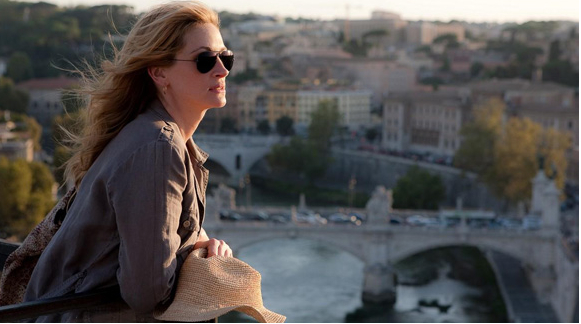 A divorced American woman sets out to find food in Italy, faith in India, and love in Bali? Yawn. Needless to say when the movie came out starring Julia Roberts, I still had little interest in this story. This past December my husband and I set out to visit my Motherland, Bangladesh. It was a first for us both: The first time he was visiting my country, and the first time I was returning not only after a 3 1/2 year absence, but as a married woman. 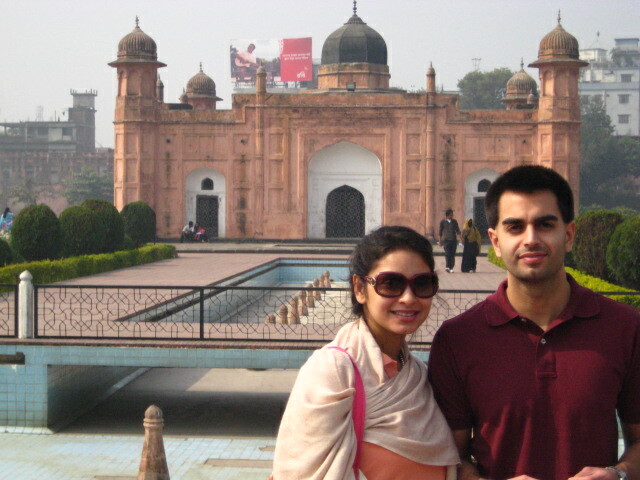 My Husband & I at Lal Bagh Fort, a Mughal Fortress in Dhaka. Image Credit: Samier Mansur. On the plane, Eat, Pray, Love was being shown in every language, on every channel for what seemed like the entirety of our 27 hour flight. Out of airplane boredom , I flipped to watch the movie and gave it my undivided attention. I loved it. Although the film did not do as well as the book, and many people didn’t think it did the novel justice, I unexpectedly loved every second of the movie. And watched it three times back to back. I couldn’t help but wonder why most Americans in their lifetime either do not travel much or just do not travel at all. Being a Bangladeshi, there is a huge determining factor regarding where and when I can travel every time I want to go to another country. That factor would be a visa, a word which can pretty much sum up my entire life. Want to visit India next door to Bangladesh? You need a visa. Want to go to college in the States? You need a visa. Want to go for medical treatment in Singapore? You need a visa. Want to eat, pray and love outside your country? You need a visa! Americans do not need visas to travel anywhere pretty much, and in the rare cases they do, they can get them on arrival at the airport. Is it not ironic that the people with the least difficulty when it comes to traveling, ie Americans, hardly ever bother to see the world or even apply for a passport, yet the people who have some of the most rigid rules to follow when it comes to even trying to see the world, do so all the time? After decades of dealing with visa applications, it has become the norm for me as it has for people of many, many other countries as well. It just makes you think of one of the biggest double-standards that still exists in our world today: How where you are born determines where you can travel to for the rest of your life. The best thing about getting the time on my flight to watch Julia Roberts tell the real life story of author Elizabeth Gilbert? Getting the idea of starting my own picture box of all the places I want to visit and will. Once I get my visa, of course. It’s so very true. Although I carry both Bangladeshi and British passports, I almost always travel on the British one for the convenience, and because I get fewer suspicious looks in airports. We haven’t even discussed getting our daughters Bangladeshi passports. The British and American ones will be only ones they’ll ever use. My husband has lived in four countries, and yet doesn’t have a passport. As a member of the US military, he’s never needed one. Thank you my AIS/D alums! Sadia, how are you? Just went through your blog, may need to become a frequent visitor soon inshallah 😉 Congrats on your family and a great blog! Oh and yes, now that I am married to an American, no doubt which passports my kids will have/use! A great post! I was all the time wondering if I am the only one who is NOT fascinated and captured by the book. I come from Germany and am a passionate traveller as well but the book couldn’t really reach me. I had similar thoughts as you had… I thought the book was fairly trivial at many passages, and that is was more of a “desperate American woman” story… but I have to agree with you that the movie is just fine. It is good entertainment, at least!